The craftsmanship is of a very high standard it has been completed with care and enthusiasm. The team worked tirelessly and tidily none stop. 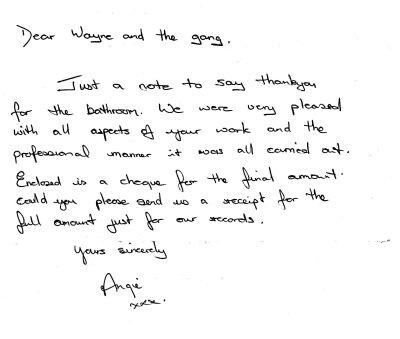 We will take every opportunity to recommend you to all our friends and acquaintances. 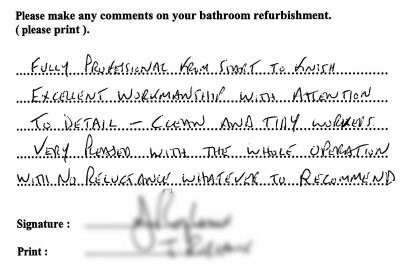 First class job done by the lads on our bathroom. The results are stunning and we are absolutely thrilled with it. Disruption kept to a minimum a good clean job very well done. Absolutely delighted. 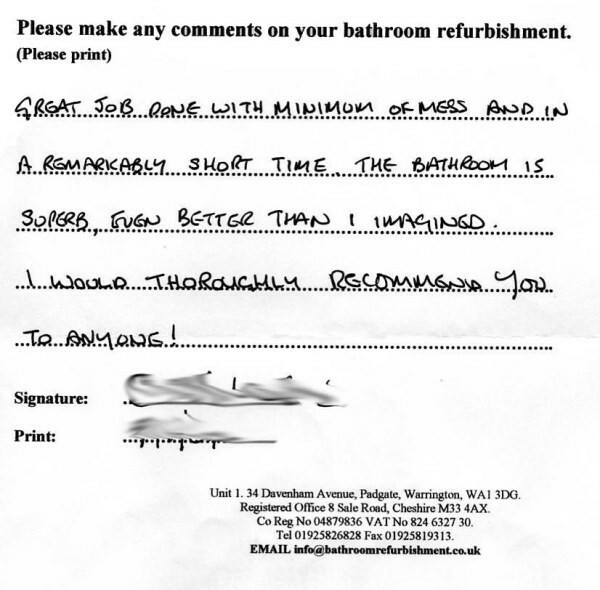 The bathroom has been transformed and would have no hesitation in recommending you. A job very well done. 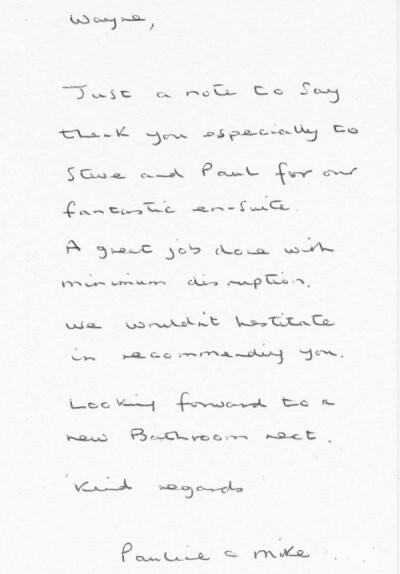 A huge thanks to Steve and Paul who worked so hard despite the abnormally high temperatures. 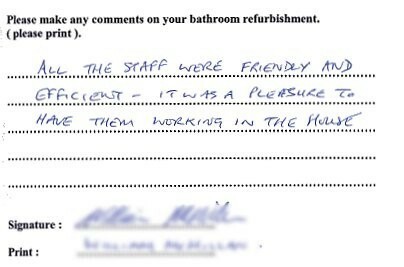 Thanks for all the work we are really pleased with the results. 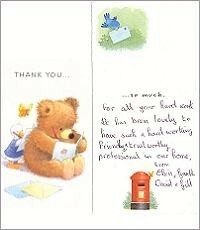 Thank you for the way you worked, arriving promptly each day and always leaving the house in a tidy state. 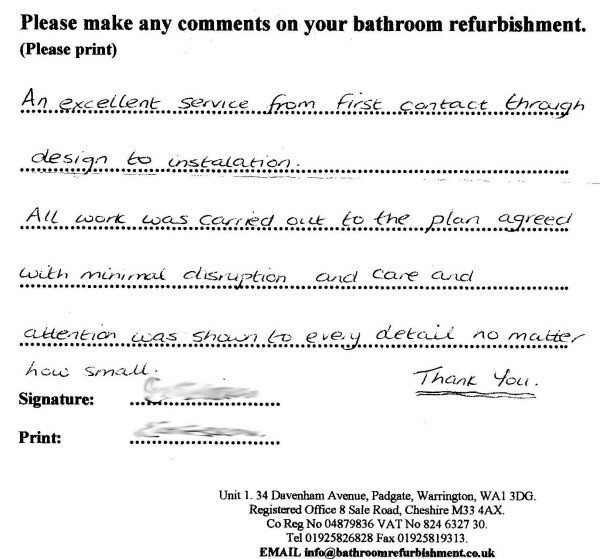 Excellent service from the start, excellent workmanship and very pleasant team. Thank you so much for all your help and advice. An excellent service from first contact through design to installation. All work was carried out to the plan agreed with minimal disruption and care and attention was shown to every detail no mater how small. 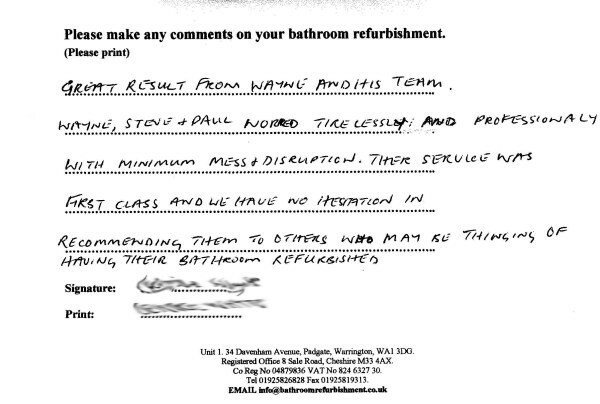 Great results from Wayne and his team worked tirelessly and professionally with minimum mess and disruption. 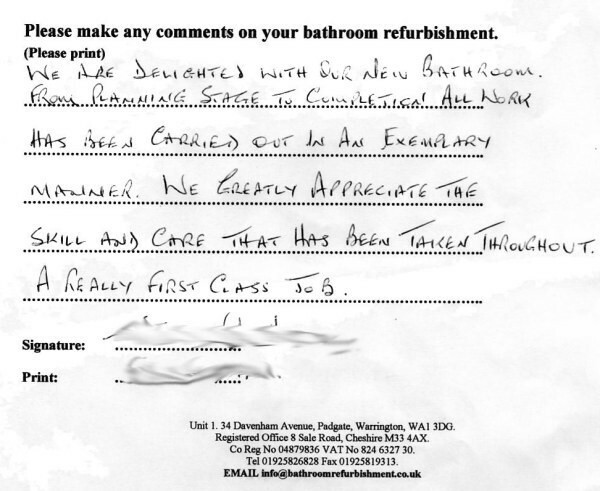 Their service was first class and we have no hesitation in recommending them to others who may be thinking of having their bathroom refurbished. We are delighted with our beautiful new shower room which looks good enough to feature in one of the glossy magazines! Our thanks go to the whole team who worked tirelessly and were really skilled craftsmen and to Wayne for the design and organisation. 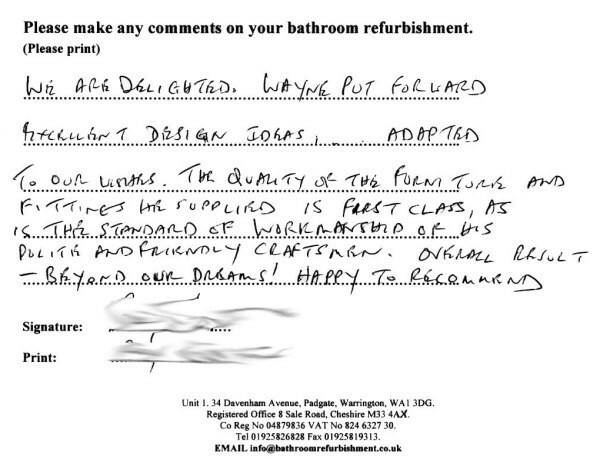 We are delighted Wayne put forward excellent design ideas adapted to our wishes. The quality of the furniture and fittings he supplied is first class as is the standard of workmanship of his polite and friendly craftsmen. 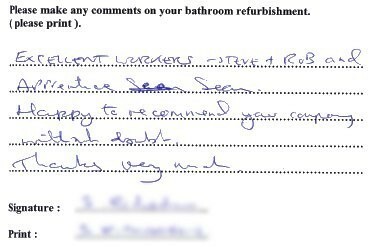 The overall result is beyond our dreams happy to recommend. Great job done with minimum of mess and in a remarkably short time. The bathroom is superb even better than I imagined I would thoroughly recommend you to anyone.